Pavlova was OAR’s best player. 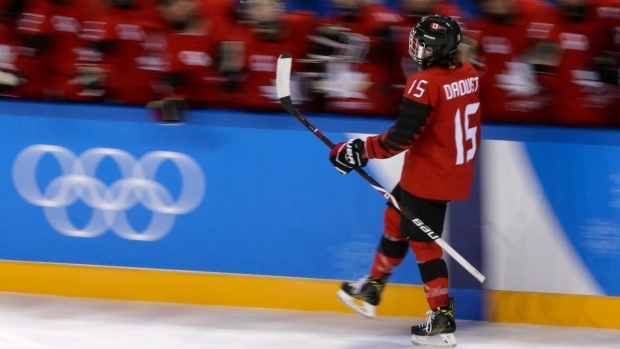 Indeed, she had five of the team’s 12 shots through 40 minutes of play and six in the game. She made two toe-drag moves in quick order and fired another good shot that was expertly blocked by Desbiens. Pavlova had previously helped the Russians win bronze at the 2013 and 2016 Women’s Worlds. The first question for this game was: who will start for the US? The answer is Maddie Rooney, who goes up against Noora Räty. Rooney’s the youngest of the three American goalies, she put off her junior year at the University of Minnesota-Duluth to compete. Riikka Valila is the starting centre for Finland, the only player in the competition older than me. Early power play to the US, who knew Jocelyn Lamoureux could draw penalties as well as take them? Finland gets the puck out fast, and the Americans spend the first minute without a shot. They get called offside twice in quick succession and only get off three shots, the best opportunity by Amanda Kessel. Six minutes in and still no shots for Finland, who haven’t spent much time in the offensive zone. As in the Sweden-Japan game, there’s contact going on that isn’t getting called. Venla Hovi gets the first SOG for Finland about 7:30 into the game. Considering how much they have the puck, the Americans are passing more than they should. I know it’s difficult to score on Räty, but it’s harder if you’re not shooting. Quick offensive flurry by Finland just past the halfway mark, featuring Annina Rajahuhta, who spent time in the CWHL this season with Kunlun Red Star, but Rooney has it handled. Monique Lamoureux is totally the person I’d expect to have one of the better opportunities on Räty (mostly kidding, despite the Lam twins’ violent reputations Monique Lamoureux is actually third all-time among active players in Olympic points per game). Megan Duggan and Emily Pfalzer combine for a dangerous chance but Räty smothers the puck. In a complete reversal of how the period started, Venla Hovi scores with 5.8 seconds in the period, putting Finland in the lead 1-0. Linda Välimäki and Petra Nieminen get the assists. It’s a quick, low shot under pressure that makes it over Rooney’s pads. The US outshot Finland 11-9 but it’s not the shot clock that counts. Finland gets in some offensive zone time early and this period looks to be much more even than the first. Amazing what having the lead can do. The Finns clearly want to follow up on that first goal quickly and they’re pressing. 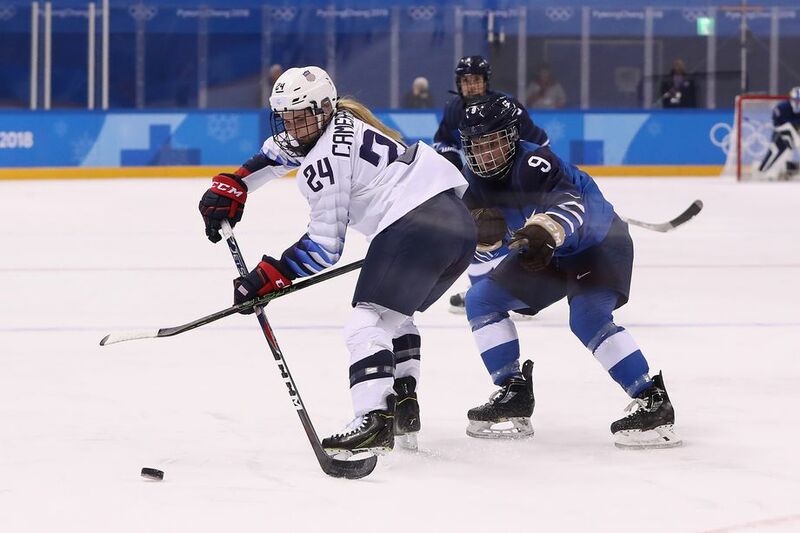 Cassie Campbell-Pascall declares that the Lamoureux twins and Amanda Pelkey have been the best line so far for the US. That’s their fourth line. That’s not good. Finland is called for interference and the US has their second power play. This is a better power play than the first one, with most of the play in the Finnish zone, but the Finns get a shorthanded 2 on 1 near the end. Kelly Pannek gets a great chance right after the penalty expires but Hovi checks her stick from behind. The male commentator (Mike Lee, I think?) has developed the habit of calling Räty “Rootoo” about half the time and it’s getting annoying. Michelle Karvinen gets a breakaway for Finland but loses an edge before she can shoot. The US really is not dominating this game the way they were hoping. The Americans get some sustained zone time, they’re still ahead on the shot clock, but nothing doing and the Finns break out again. Both teams turn on the pressure in response and Finland gets their third penalty of the game as Linda Välimäki goes off for tripping. The Finns get a nice shorthanded chance very quickly, headed up by Riika Valila. The US get it back, have some trouble staying in the zone, but then Hilary Knight gets the puck to Kendall Coyne and finally the big line scores for USA. 2-1 on a beauty of a shot by Coyne. Brianna Decker gets the secondary assist. The Finns are still getting chances but it’s clear the Americans smell blood. They’re currently outshooting Finland at a rate of 3 to 1. The pressure results in yet another Finnish penalty as Knight goes down, and it’s Mira Jalosuo to the box for tripping. First mention of “Phil Kessel’s sister” when Amanda Kessel gets a couple of chances on the power play. Shots on the period were 23 to 5 for the US. It seems like the Americans are figuring it out and that’s bad news for the rest of the group. The Americans start things where they left off, putting pressure on the Finns. Finland clears the puck a couple of times but this is all the US. Välimäki gets the first Finnish shot on goal almost five minutes into the period. Brianna Decker gets the first penalty for USA, interference on Välimäki. The Finns are enthusiastic but can’t get one past Rooney. Still, they seem revitalized and spend some more time in the American zone at even strength. 8:00 left in the game and the Finns get the puck behind Rooney… but not behind the goal line. Luck is with the Americans. Unfair, really, it’s not like they need it. Jenni Hiirikoski is getting a lot of ice time in the third and showing why she’s one of Finland’s best players, leading whatever offense they can muster. Noora Räty stops Kendall Coyne one on one with just under six minutes left, keeping things close even though the US has passed the 40 shot mark in the game. Hannah Brandt gets a delay of game call with 4:40 left when she flips the puck out over the glass. Finland calls a time out. Reference has been made to Worlds when head coach Pasi Mustonen pulled the goalie for a 6 on 4 with eight minutes left in the semi-final against Canada but he doesn’t opt to do that this time. The Finns hit a couple of posts, they’re doing everything they can. The US gets it out with 40 seconds left in the penalty and the Finns don’t really get set up again. Räty is finally pulled with 116 seconds left in the game. The US miss one empty net and get called for icing. Räty ends up back in the net for a neutral zone faceoff and has to make a couple more saves. She doesn’t get back out until 30 seconds are left…. and then Dani Cameranesi (because it’s a question every time she’s mentioned, yes she has a brother spending time between the ECHL and the AHL) puts the game away for the US with the empty net goal, assist to Megan Keller for finding her instead of icing it. US wins 3-1, outshot 10-8 in the final period but up 42-24 in the game. Couple of good signs here for the Americans and not the performance Finland was hoping for.